Around 1864 he won an important commission from the Italian king to paint Savonarola. Girolamo Savonarola was a 15th century fanatical Dominican preacher and moral dictator of Florence from 1494 until his execution in 1498. (3) This work was initially criticised, which prompted Andreotti to abandon historical themes and devote himself to portraits and period scenes. (4) These were highly sought after by American and European collectors. His paintings are always in a realistic genre and most often of aristocratic scenes in dress from the 17th and 18th centuries of the Rococo period. The elaborate period dress and affected airs are sometimes described as 'Rococo Revival', popular between 1840 and 1870, and also known as the ‘French Antique’ style. (5) The late 19th century saw a resurgence of interest in historical figurative paintings set in this period of elegance and many artists, including Andreotti, looked to satisfy the growing desire for these works. 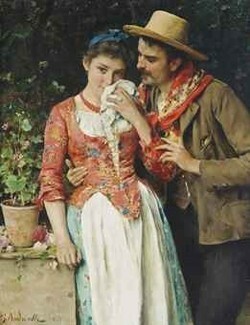 (6) The subjects of Andreotti’s paintings are often young women and couples in various stages of courtship with titles such as Courtship and The Love Letter. Musical instruments and romantic landscapes are often depicted. 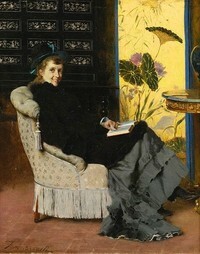 A number of his paintings were reproduced in important art reference books during the late 19th century. This graceful and elegant painting was exhibited in Florence, Italy in 1891. 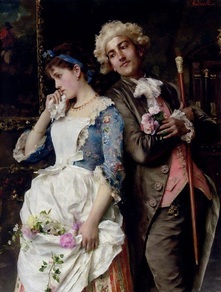 In this painting, one of at least three with the same title, a jauntily posed gentleman looks fondly towards his beloved as he symbolically holds her skirt, which is decorated with a garland of roses, some of which have fallen to the ground. 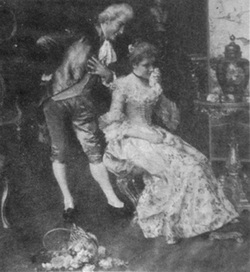 The beautiful young woman pretends not to have noticed as she lightly touches the keys of an ornate harpsichord. Roses were a popular symbol in the Rococo period and are still considered an ambassador of love. (1) This sentimental scene accurately and intricately depicts gold Rococo furniture with its curved, feminine legs and elaborate picture frames. On the table, below the mirror, sit two baluster-shaped oriental vases with lids and, according to Bernard Whitworth, clockmaker and Fellow of the British Horological Institute, an ornate late 17th century French style clock with a tortoiseshell-inlaid case (personal communication, 2014). As in all of Andreotti’s work, including those with landscape backgrounds, the details are meticulously painted, showing his early training as an academic artist. The brushstrokes and palette show the influence of the Impressionist movement of the time.